Self sign-up groups allow users to choose the group they want to be in as part of a group set. You can also limit the number of members who can sign up for each group. Note: You may have to change the group settings later if you want to prevent students from switching sections. Create a name for the group set in the Group Set Name text field . Click the Allow self sign-up checkbox . 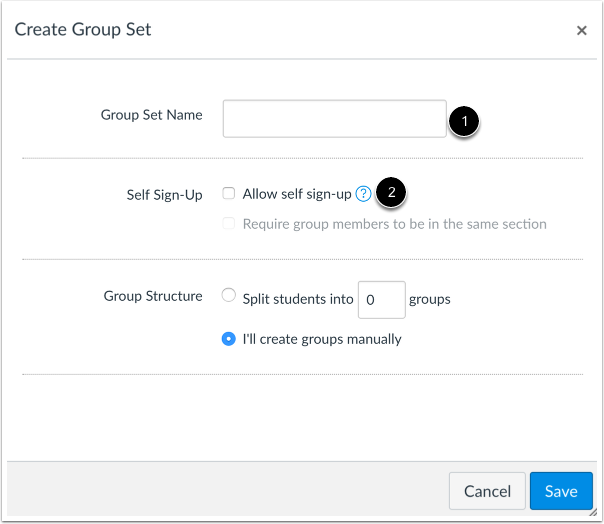 If you want to require group members to be in the same section, click the Require group members... checkbox . 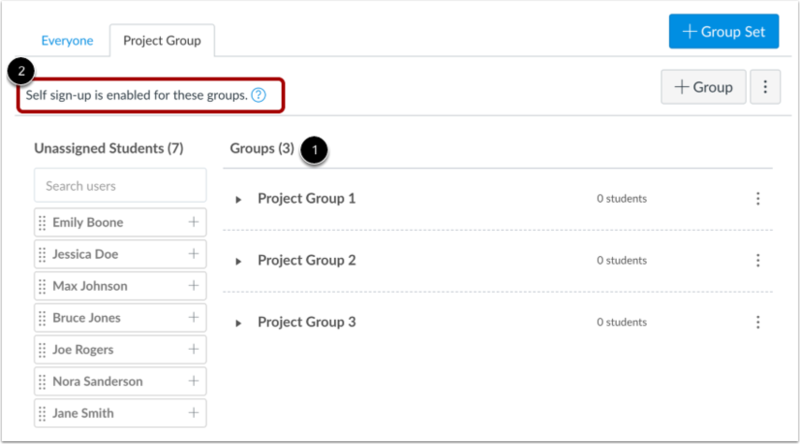 Next to the Group Structure heading, enter the number of groups you would like to create . You can create more groups at a later time, if necessary. You can also use the arrows in the number field to increase or decrease the number. You can also limit the number of group members for each group to help keep your groups balanced. To limit a group, type in the maximum number of members who can be in a group . Once the group is full, students will not be able to join the group. If you do not want to limit the group, leave this field blank. 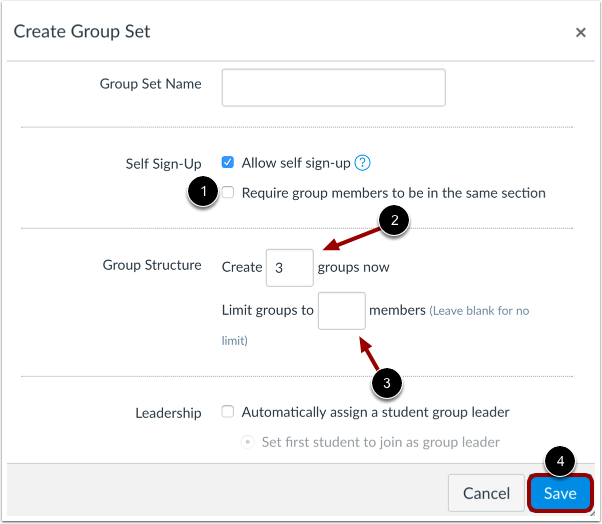 Limiting the number of group members will apply to all groups within the group set, but you can change member limitations within groups by editing an individual group. However, at a later time if you decide to edit the entire group set and change the group set limitations, Canvas will override all member limitations created within individual groups. Groups will be automatically named based on the group set name. View your new groups in your group set . Verify your self sign-up group underneath the group title and group settings . 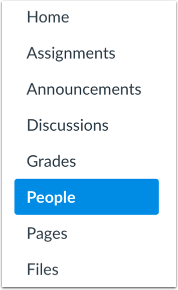 To manage a group, click the group Options menu . To edit the name of the group, click the Edit link . To delete the group, click the Delete link . Previous Topic:How do I manually create groups in a group set? Next Topic:How do I automatically assign students to groups? Table of Contents > Groups > How do I create self sign-up groups in a group set? Re: Function for students to form pairs? Re: How do I sign up students for group projects?